With its sunny, brisk mornings and beautiful falling leaves, autumn is an enjoyable time of year. 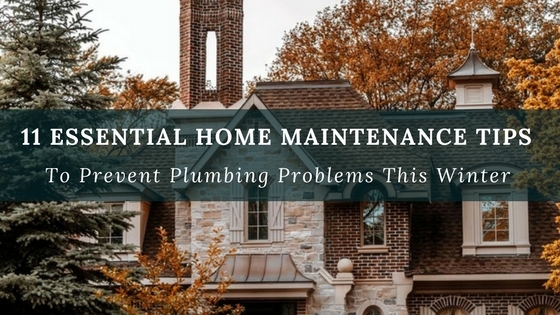 But, it is also an important season for home maintenance. Fail to prep your home for winter and you could see some big problems start to pop up, costing a lot of extra dollars. Your plumbing system is, particularly at risk. Here are a few simple tasks to add to your fall ‘to do’ list to prevent plumbing problems from arising this winter. It seems as though the majority of your fall home cleanup jobs are outdoors. While you’re out there raking the leaves and putting away the summer toys, don’t forget about your plumbing system. Since you won’t be using your hoses and sprinklers for the next few months, be sure to detach them and shut off the valves to prevent any water from flowing through these faucets. Leaving the hoses attached can cause pipes to burst when the temperature drops. It’ll also really damage your hoses and sprinklers, meaning you’ll have to buy new ones come spring. Check for any faucets that have been leaking and replace them; consider installing a freeze-proof faucet if you plan on using your outdoor water source at all during the cold months. Another consideration to make is purchasing a faucet cover. Once the leaves have fallen, you must remember to clean your gutters. Failing to do so will restrict water flow; a water backup here will cause water to leak into your home, causing major problems long-term. What’s more, if water gets trapped here and freezes, the gutters may even crack or break away from their attachment house. This unnecessary problem is easily prevented by simply cleaning your gutters! Do you have a water fountain, pond or pool in your backyard? Be sure to drain and/or cover these properly. If water freezes here, you could run into major plumbing problems, such as burst pipes and cracked structure walls (learn how to keep your pipes from freezing without heat). All of this equals a lot of money you would probably much rather spend on something more fun next spring! Do you have any exposed pipes on the exterior of your home? How about in your garage or in the crawl space? If so, be sure to wrap prep them for winter by wrapping them in insulation or heat tape to protect them from the cold. You may want to consider having this done professionally if you aren’t sure how to do it properly. Check your septic system. Does it need to be pumped soon? If so, you’ll want to make sure this is done before the temperature drops and the ground becomes hard. While it seems the majority of your preventative home maintenance tasks are outside, fall is an important time of year to make sure your plumbing is up to par on the inside of your home, too. Check all your indoor plumbing fixtures for leaks as well (i.e. toilets, faucets, shower heads, etc.). While this is good practice any time of year, you’ll particularly want to make sure these are fixed before winter hits. Don’t forget about your water heater! Be sure to do regular maintenance on your water heater during the fall as well (learn how to avoid this common plumbing issue). This process will include an overall inspection and replacement of any damaged or worn-out parts. Also, be sure the air intake and exhaust vents are free from any debris, or snow! If you have a seasonal or second home that you won’t be visiting all winter, consider shutting your water heater off altogether during this season. This will prevent rust and any sediment from building up in the tank. Further, if the water in the tank freezes, it will expand and potentially burst the entire tank right open! Do you have a sump pump? If so, ensure it is in good working order before winter hits. Call a professional plumber if you suspect it isn’t working properly, or don’t know how to inspect it. Remember to never turn the heat off completely when leaving your home in the winter months. While it may seem like a good idea to save money on your heat bill, your putting your plumbing system at risk for disaster. Repairing a burst pipe will cost a lot more in the long-run. If you’re leaving for an extended period of time, consider just lowering the heat in your home while you are away, rather than turning it off altogether. Remember to also unplug all electronic devices from the outlets in your home before leaving. Have any questions, or need help with any of the above tips? Don’t hesitate to give us a call at Accurate Leak & Line! We specialize in all kinds of residential plumbing services, and are happy to help in any way. Now get outside and enjoy this beautiful weather before it’s gone!